You are here: Home / What is Phonics? What is phonics? This page is not meant to scare you with phonics terminologies, but make you realize that you already know this stuff in your own words. So you have heard words like phonics, phonemes, phonetics, phonemic awareness and other 'phon' words being floated around. Well, don't get frightened or turned off just yet. You already know this stuff. It is just professionals trying to intimidate you with big words. Did you notice that words with 'phon' always have something to do with sound, like phone, microphone etc. So when you hear or see a 'phon' word, think of 'sound'. When it comes down to it, phonics is all about teaching children the sounds in English words. When you can identify sounds in words and sentences, you are well on your way to becoming literate. You can even start forming your own words from combining sounds like this one by Mary Poppins "Supercalifragilisticexpialidocious" which means nothing really. Well, with phonics, your child will have the confidence to identify the vowels, consonants and syllables and can at least attempt to read the word. Phonics basically teaches your child how to sound out words in the English language. Okay, enough of that! It is often best to start learning to read through phonics from preschool to 2nd grade or from about ages 3 to 8. Research has shown that children who have not developed reading skills by second grade, will experience an overall delay in learning throughout their school life. 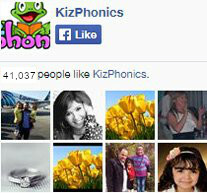 What kind of phonics approach does Kiz Phonics use? At Kiz Phonics, we use a direct systematic and explicit phonics approach to organize our materials here. You can see this especially in the arrangement of our worksheets under different levels. They are arranged in the order in which they should be taught. However, those using an embedded phonics approach may simply look for materials by type. After you choose a worksheet, find a video, game and listening to go with that worksheet, by searching. I am a parent. How can I help my child learn to read? A child actually begins to learn to read at home, not at school. Teachers finish the job at school. Even with teachers helping at school, children always do better when their parents are involved in their learning. Set aside as little as 20 minutes everyday to do a phonics lesson. Just keep it regular. You can follow our program structure here. A phoneme is the smallest unit of sound that can differentiate meaning. For example, in the word cat, we can hear three distinct phonemes /k/ /a/ /t/. If we change /k/ /a/ /t/ to /k/ /a/ /p/ the meaning of the word will change completely. Therefore, it is very important for children to be able to clearly hear and distinguish phonemes. Phonemic awareness is the ability to hear and manipulate individual phonemes. Phonemic awareness is the realization that within a word are individual sounds or phonemes. Before your child can start to read out words and sentences in English, the child needs to develop print awareness. Print awareness refers to a child’s understanding and use of print. Print awareness has a direct relationship to word awareness. Word awareness is the ability to recognize words as distinct parts of oral and written communication. Before kindergarten, most children should possess this skill. Print awareness is the first step in developing literacy and is best done at the preschool level. How can I develop my child's print awareness? Teach the names of letters A to Z. It is very important for teaching letter sound correspondence. Show a word and ask the child which letters are in the word. For example the word dog has the letters d, o, g.
Show the child the first word of a sentence and ask him or her to show you the lasBy the time, your child or children can do all of the above, they would have achieved good print awareness. For non-native speakers of English, it is always a good idea to use an English book. This is because not all languages always write from left to right. What is the difference between a phoneme and a grapheme? We said earlier that a phoneme is the smallest unit if sound that can differentiate meaning. If a phoneme is the smallest unit of sound that can differentiate meaning, then a grapheme is the smallest unit of written language that can differentiate meaning. A grapheme could be a letter or a symbol. The letter a is an example of a grapheme. The sound(phoneme) the grapheme a makes can be /a/ as in apple. Please note that the problem with English is that we have 26 letters of the alphabet, but over 44 phonemes. For example c can make two sounds. We have c as in cat and c as in city. Also, c can combine with h to make a different sound /ch/ as in chair. Think about it this way. There are 26 letters of the alphabet (which are 26 graphemes). One of these letters is 'y'. The letter 'y' makes 4 different sounds. Don't believe me? Well look at these words: yak, gym, baby, cry. To make matters worse, the letter 'y' can make consonant and vowel sounds. This means, the letters of the alphabet are unreliable for teaching phonemes, but they can be a good start for teaching key graphemes and phonemes. That is why phonics goes way beyond letters of the alphabet. Are there different types of phonemes (sounds) in English? Sounds are commonly broken up into two groups, some would say three - Vowels, Consonants and Diphthongs. Vowels are sounds that are said without stopping the flow of air from your lungs. The most commonly known vowel sounds are made by the letters a, e, i, o, u. These letters can represent short and long vowels. Try to say the following words: apple, egg, igloo, octopus, up. Did you notice that when you say the short vowel sounds of a, e, i, o, u, the air in your mouth isn't stopped? That's what vowels do. The most common misconception people have is that there are 5 vowels in English. True and False! There are 6 letters (a, e, i, o, u & sometimes y) that commonly represent vowels, but there are at least 19 vowel sounds in English. OMG! Okay calm down! And you over there, stop yawning! You will learn the sounds in our program without this. Okay let's talk about consonants. Consonants, are sounds that are made by partial or complete closure of air coming from your lungs. Consonants are most commonly represented by all other letters that are NOT a, e, i, o, u. This means b, c, d, f, g, h and the rest. There are 25 consonant sounds in English. This consonant and vowel business is confusing me. There are 26 letters of the alphabet. The 26 letters can be manipulated to make 44 sounds. There are 44 sounds in the English language. Of these sounds, 19 are vowel sounds, while 25 are consonant sounds. The vowels are most commonly represented by the symbols a, e, i, o, u. The consonants are most often represented by symbols b, c, d, f, g, h, j, k, l, m, n, p, q, r, s, t, v, w, x, y & z. The letter 'y' can make a consonant and vowel sound. By playing around with these 26 letters, through phonics, we can learn the 44 sounds (phonemes). For example, we can put ch together to make a new sound as in the word chair. This art of combining 2 letters to form one sound is called a digraph. There are consonant and vowel digraphs. Yes, I did and you already know it. A digraph is when a pair of letters come together to make one sound. For example, s + h combine to make the sound we hear at the end of fish. Common consonant digraphs include: ch as in chair, sh as in sheep, th as in think, ck as in duck. Common vowel digraphs include: oa as in goat, ee as in feet, ai as in train and more.